I last wrote in late August, reporting on progress with reform and renewal of our central ringing organisation. I am now writing to give a further progress report, and to call for volunteers as Workgroup Leaders or helpers. All ringers are invited to volunteer, which can be either self-nominations or the nomination of someone else (in which case it requires their consent). Full details, and a link to the online form, are given below. C i Recruit Workgroup Leaders September – December 2017 NOW OPEN! Having reported on appointments to the Executive (in my message of August 2017), I am now inviting expressions of interest for leadership and helper roles on “workgroups”. Recommendation C of CRAG’s final report is introduced as follows – “The new Executive will, by November 2017, realign the current committees into a significantly reduced number (single figures) of Workgroups, each led by an individual Workgroup Leader.” The CRAG report describes this concept at length. Although it may appear that this realignment is merely an aggregation of CCCBR’s existing Committees, the concept is much bolder than that. Workgroups are the way that the CCCBR will deliver its plans. While they will of course continue some of the work of the former committees their priorities will be determined by the overall strategy of the CCCBR and what is necessary to strengthen and refresh ringing. Workgroups and their leaders will work closely with the executive, other workgroups and people from outside the CCCBR for a healthy future for ringing. There is one other workgroup for which a leader has already been identified, and this will be announced in due course. The online form will be open until Friday 29th September. I should clarify that those who responded in Phase I are still very much in the mix, and don’t need to re-submit. Furthermore, existing Central Council Representatives are particularly encouraged to put their names forward to assist with these new structures. Do please think carefully about what you can do for ringing, and volunteer for one (or more) of these roles. This is a fantastic opportunity to make a difference. To give something back to ringing. To build and secure a bright future for ringing. PDF copy of note attached for ease of printing – download here. I last wrote in late June, reporting on the intended direction of travel since the Central Council meeting in Edinburgh, and I want to take this opportunity to share an update on recent progress. 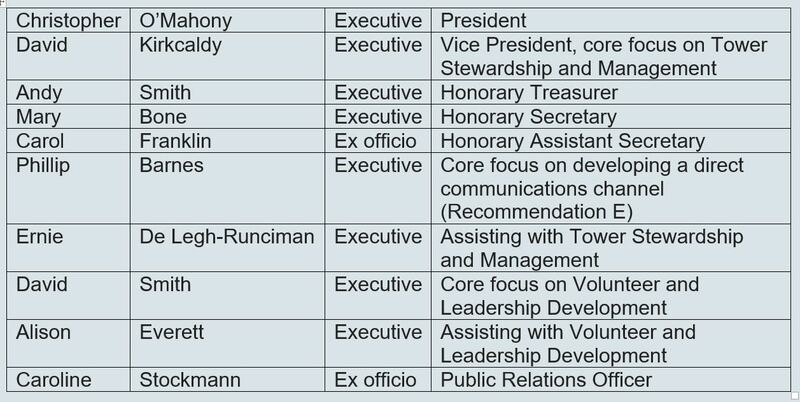 With reference to Recommendation B, I am now pleased to advise the following as members of the inaugural Executive Team. As a number of these names may not be familiar to the wider ringing community, we will shortly be putting together some brief profiles to circulate through the usual channels. The Executive team brings together an impressive range of skills, qualifications and experience, and is drawn from a broad geographical area. Two of the early tasks of the Executive Team will be to work on Recommendation A (devise and agree a five-year strategic plan) and Recommendation C (re-alignment of Committees to Workgroups). Although responses to my call for expressions of interest in late June were fewer than I had hoped, we have been able to move forward with other key items. Recommendation F aims to the simplify the rules of the Council, replacing them with a short statutory set of rules supported by a set of operating principles and procedures. I have invited Clyde Whittaker to coordinate this work, with a team comprising David Bleby, Dan Meyer, Pat Wheeler and Andrew Wilby. Recommendation H relates to the development of a “simple and permissive descriptive framework” to ultimately replace the current “Decisions” on methods – a topic that has consumed more than its fair share of airtime in recent years. I have invited Tim Barnes to lead on this framework, and he is now forming a team to assist him with the task. Over the next couple of months more information will be forthcoming with regard to these and other elements of our reform and renewal efforts. I look forward to working with these teams to take forward the work of our central ringing organisation. Much has been happening in the background since the Central Council meeting in Edinburgh, and I want to take this opportunity to share an update on recent progress. Thank you to those who have provided feedback, comments and advice. There is so much to be done following the momentous votes (and I don’t mean the national election). The main CRAG report and its various appendices go a long way to setting the agenda, and many people are working hard to follow through on the motions passed so emphatically in May. The form will ask you to provide some basic contact and demographic information, some information regarding qualifications, skills and experience, and a supporting statement. Closing date for nominations is Friday 14th July. The votes in Edinburgh have thrown down a great challenge for us, but also a great opportunity. I look forward to working with you as we reform and renew – for the future of ringing.